From left: Brandywine Living at Princeton residents Marion Carnevale 85; Donald Stern 95; Vincent Pierdinock 85; and Kirt Wedemeyer, 92. 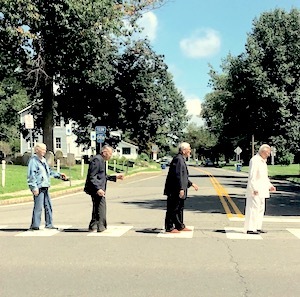 Four Brandywine Living at Princeton, Princeton, NJ, residents aged 88 to 95 recently came together to pay homage to the Beatles by reproducing the photo on the cover of the iconic 1969 album “Abbey Road.” It was in February 1964 that the band performed for the first time in the United States, with the first U.S. tour coming in August of that year — 54 years ago. “The residents loved this shoot,” said Stephanie Gaber, Escapades coordinator at Brandywine Living at Princeton.